On Sunday a huge benefit concert was held in Lucerna Hall [above] in Prague, near the Wenceslas Square, organised by the instrument maker Rosta Capek. He celebrated the 25th anniversary of his trademark Capek Instruments. 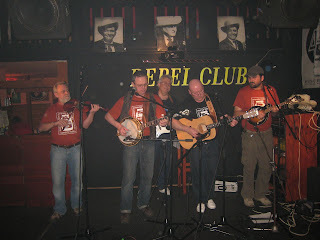 We drove from Sloupnice with Petr Brandejs, who plays banjo with Bluegrass Cwrkot, since their original banjo player Milan Leppelt – a Czech banjo legend - passed away last summer. But he has his own Petr Brandejs Band and this band opened the mammoth concert in Prague. On the way we picked up another band member, the guitar player Ondra Kozak. He also has his own band named Kreni, one of the best in the land. We arrived to Prague just in time for the sound check. Concert started at six o’clock. 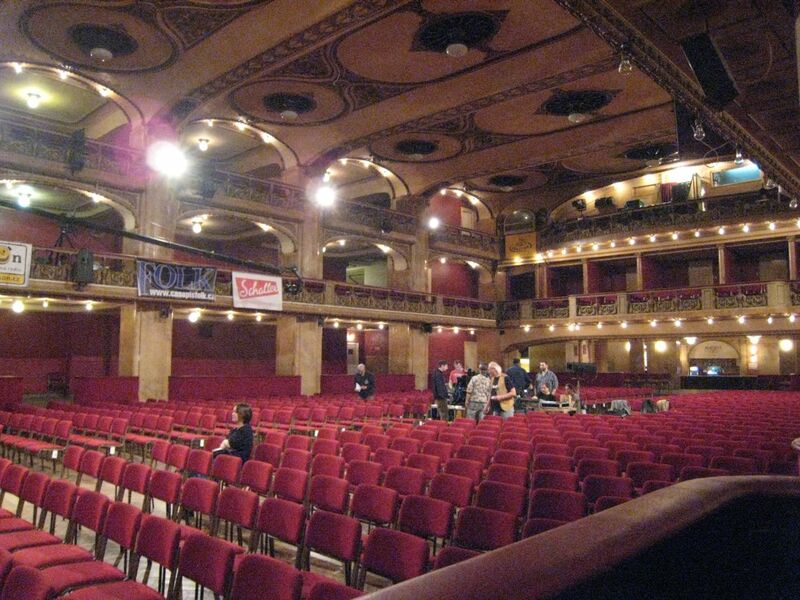 The Lucerna Hall is one of the most beautiful historical concert halls in the country. The seats were sold out months ago, so many people had to stand. Proceeds of the event were dedicated to the Jan Deyl Conservatory for blind music students, which is just celebrating its 100 years. Petr Brandejs Band opened the night. 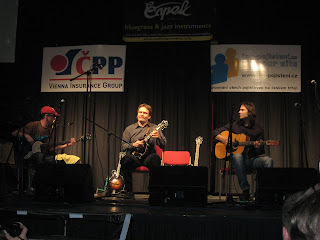 They brought as guests two other great banjo pickers, Vojta Zicha and Ondra Ruml (who was placed second as a singer in a TV show X-factor last year). 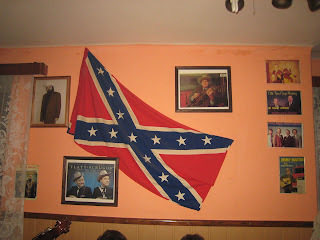 They performed 'Dixie breakdown' with triple banjos [above]. Also the mandolin wizard Radim Zenkl performed that night with several formations. The most success belonged to his original music, such as instrumentals 'Greenpeace' and 'Happy grass', which he played [above] with Jakub Racek, the guitar player from one of the best bluegrass bands, Monogram, and some other musicians. Next to mandolin he loves the Irish pipes, and people had even the opportunity to see him playing the cow horn. 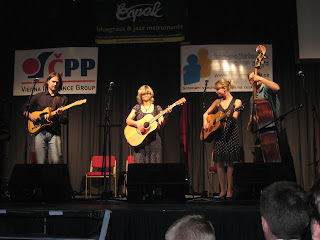 After a break, the first lady of bluegrass Pavlina Jisova & Friends [above] came on stage. The band consisted of her daughter Adelka, Jakub Racek from Monogram, and Pavel Peroutka of the best Czech vocal band Relief on bass. Petr Malasek, the famous piano player, joined them. 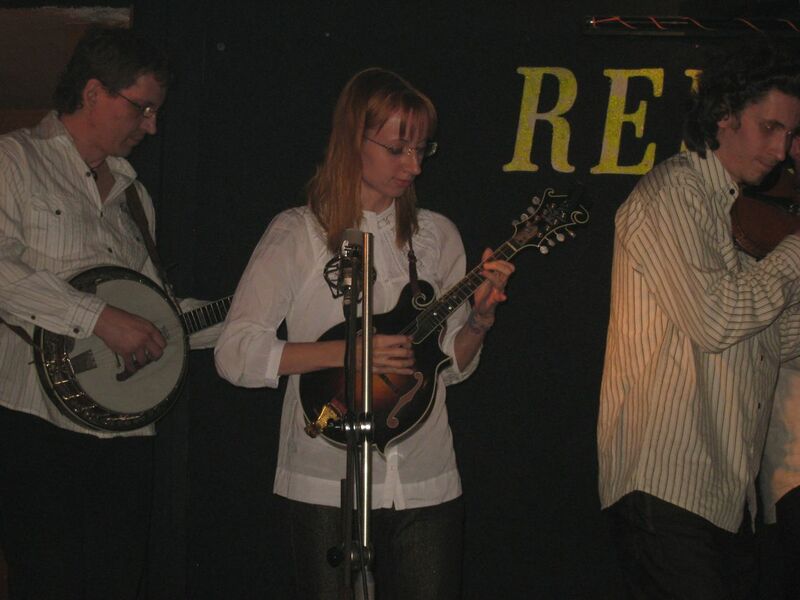 The next not-only-bluegrass act were Eliska Ptackova & Friends, with her father Vlada Ptacek on banjo (maybe some of you are familiar with Ptacek handmade tone rings, capos, tuners and so on) and Radek Vankat, a young, great Dobro player. She also sang a duet with Ondra Ruml. Marek Eben, famous entertainer and TV star called on stage Marko Cermak, who was celebrating his 70th birthday. Marko Cermak is the father of the Czech 5-string banjo. He received the IBMA Distinguished Achievement Award in 2007. 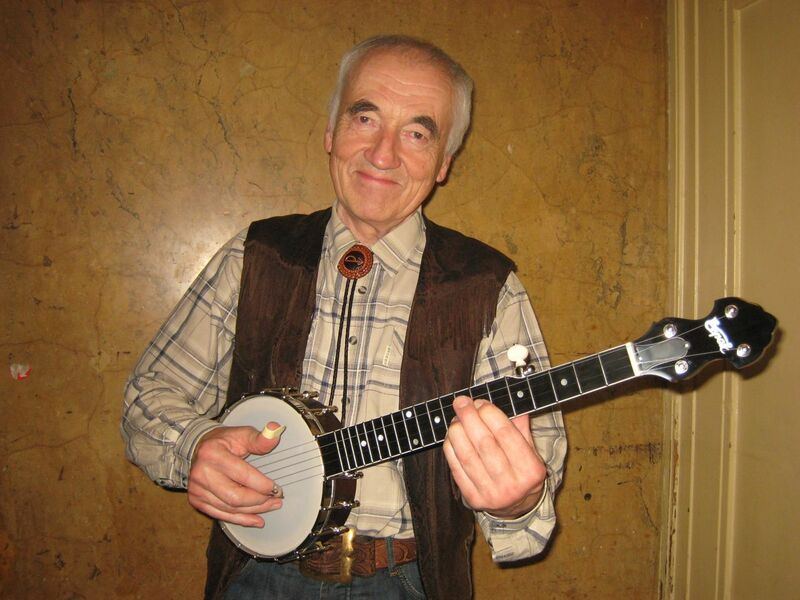 It was he who started the first Czech bluegrass bands, the Greenhorns and White Stars, in the late sixties. His first banjo was made after a picture of the one with a long neck from Pete Seeger, who was the first American artist to visit Czechoslovakia in 1964. 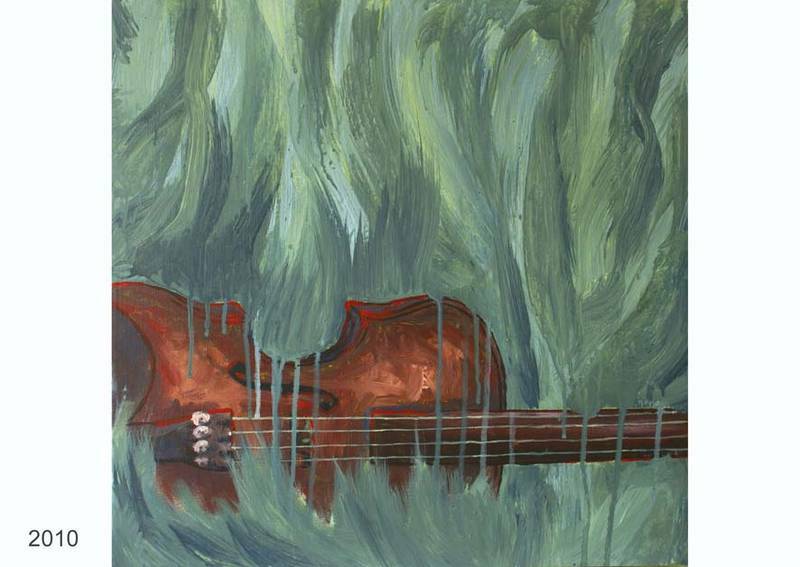 Marko is not only a musician, he is a man of many talents: painter, illustrator, and writer. 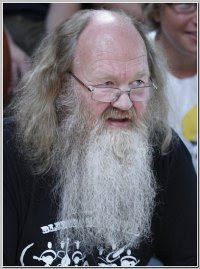 He wrote and published the first Czech tutor for 5-string banjo - Marko Cermak, Petistrunne Banjo in 1975; Banjo z mlznych lesu (Banjo from the Foggy Forrest) in 1998; and his last book, Marko Cermak: posledni romantik (Marko Cermak: the last romantic) came out recently. 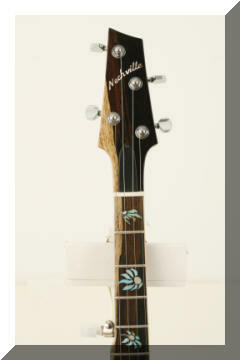 He received as a birthday present a little travel banjo that Rosta Capek made especially for him [above and below]. The high point of the night was when the Deyl Conservatory received the money check from Rosta, rounded up by some sponsors. I am sure the money goes to the right place! The show continued with many other artists. At the end, all musicians came on stage. On the side screens showed up the pictures of the beloved Czech singer and banjo player Waldemar Matuska, who passed away in his home in Florida last year. 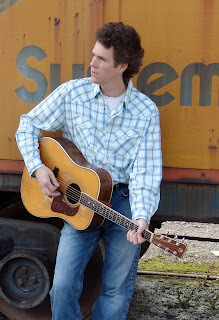 Thanks to Walter Fuchs for the news that singer/songwriter James Talley (USA) will give tomorrow his last concert in Europe before flying home to the US. He will appear tomorrow (1 June) at 21:30, together with Joost van Es (fiddle) in Frankfurt am Main, Germany, at the 'Dreikönigskeller', Färberstrasse 71. Tel. +49-69- 66129804. Seats can be reserved by e-mail. 31/05/2010: Now available online at EBMA: Limited edition of postcards with EWOB artwork by Liz Meesters-Janssen. 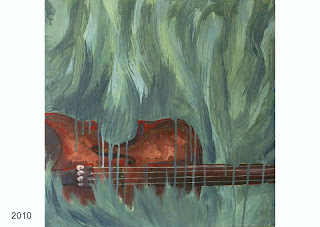 Since 2001, Liz Meesters has created many wonderful bluegrass paintings, ten of which were used during the European Bluegrass Month each year. As a tribute to her great work, EBMA now offers a set of postcards in a limited edition of these paintings. Now, you can buy them for your personal collection or send the message out into the world with a greeting. Check out the EBMA-Shop for details! 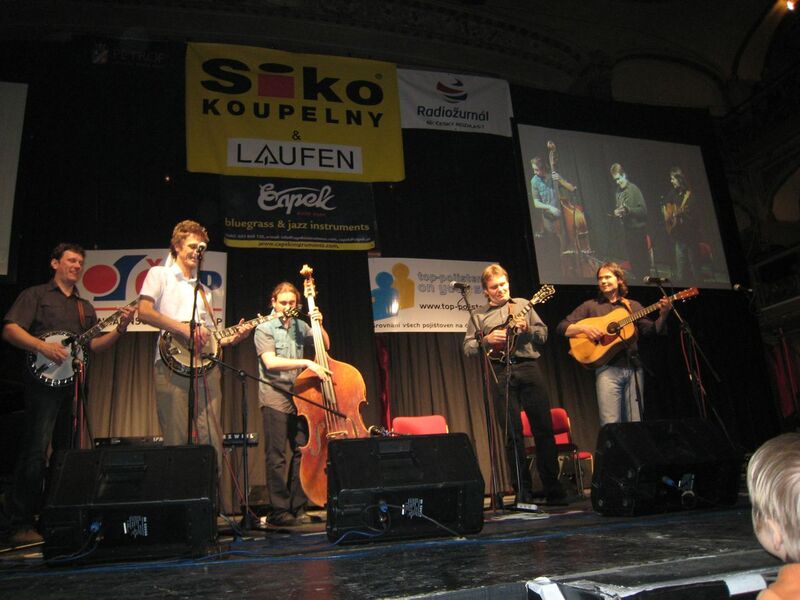 Czech Bluegrass Spring IV: regional contest at Sloupnice, 17 Apr. There are very few white spots on my Czech bluegrass map. The Old Rebel Pub in Sloupnice was one of them. On Saturday 17 April one of five regional qualifying rounds for the Banjo Jamboree band contest took place there. Bluegrass Cwrkot [above] - a very traditional house band, playing in Lester Flatt & Earl Scruggs style (the guitar player Hombre Lzicar is the pub owner) - opened the evening program. They are quite famous in Europe: last weekend at the EWOB Festival in Holland they were placed second by audience popularity award. There were five bands competing. The best will be chosen to play the main contest at the Banjo Jamboree Festival, the oldest bluegrass festival in Europe, Saturday 18 June. The winning band will have then the opportunity to play next year in the main festival programme. The bands were mostly new to me. As first, a band Early Times [above] from Brno with a very good female singer, Helena Novackova, came on stage, playing mostly traditional materials. If she will practice more on her guitar, I can see a good future for them. I loved especially their encore, 'Anthony' from Nickel Creek. Well done! The next band was Twisted Timber [above]. 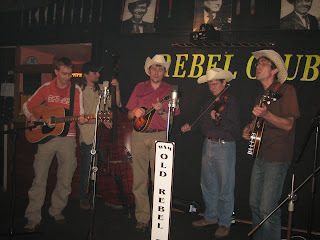 They play mostly progressive bluegrass with a lot of original materials. Their English was just perfect, with no accent. 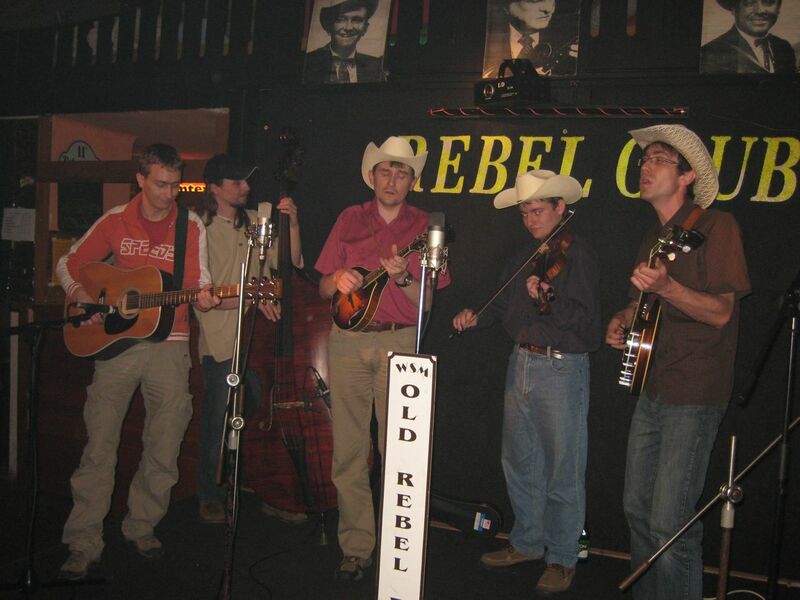 No wonder - their lead singer and fiddle player, Matthew Whitten, came from the Shenandoah Valley of Virginia. I liked also their female mandolin player, Zuzka Liskova, who also is a great songwriter. Their instrumental work was very good. The next band I met already last weekend at the Minifestival in Luka. The Giant Mountain’s Band [above] came from south Bohemia. Well dressed, with accent-free English and great instrumental work, they were about the favorites. 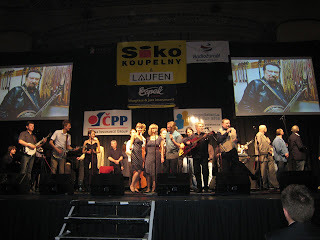 Bruno Unit [above] represented the older generation and their leader Vlada 'White' Bily is one of the Czech bluegrass pioneers. The band was founded in 2000 in northern Moravia, close to the Polish border. I know some of the band members, but heard them for the first time. And I liked it! The last band was a young local group, Trautengrass [above]. Although the guitar player broke a string at the beginning, they showed a lot of temperament and the audience loved them the most. The three members of the jury (the audience was the fourth one) had a really very hard job, because all the bands were about on the same level and it was pretty high. The final decision fell on the Giant Mountain's Band. But, if it were not in the Czech Republic, I am sure, all the bands could be chosen for any other festival... The night jam sessions lasted almost till the dawn. Planets in our musical universe must be aligning in favor of guitarists in 2010? No fewer than three (3) highly praised, quality publications have been released this year. All have proven to be extensively researched and well-written works on the life stories of American legends and innovators in guitar playing: Clarence White (The Essential Clarence White), Tony Rice (Still Inside: The Tony Rice Story), and as recently as last week, Doc Watson (Blind But Now I See: The Biography Of Music Legend Doc Watson). "Bluegrass Europe" magazine published an article & review several months ago on the amazing Clarence White book & CD-Rom package (biography, guitar tab and extensive technical text on Clarence's techniques, etc). Watch for a review of the Tony Rice book "Still Inside" on this blog next week. I will tell you that it is perhaps the most personal and uncensored version of a contemporary music legend I have ever seen in print, and all done with Tony's able assistance and his blessing...no matter how painful it may have been. This book uses Tony's own words, as well as quotes and stories from his peers, fans, friends and family. The authors (accomplished guitarist& educator Tim Stafford and journalist/lifetime bluegrass fan Caroline Wright) applied some very innovative ideas in constructing the chapters in this publication. Caroline also included a "road diary" she kept while traveling with Tony over an extended period of time. A very impressive work from beginning to end. I expect to review the Doc Watson biography in the coming weeks. "Blind But Now I See" was just released this past week. From all accounts thus far, this book is also a well-written and honest account of the life of one of the most influential American guitar legends in history. An extensive work, resulting in an in-depth look into a man with an extremely long and heralded career very few have ever experienced. 'Sweden's Got Talent 2010': vote Cold Mountain Band to the final! Two more acts will be chosen to play in the final after the semi-finals have been aired. One of the acts will be chosen by the jury and the other on the internet, where the general public will get the chance to vote for their favorite act. Internet voting has started and will continue until noon Sunday 30 May. 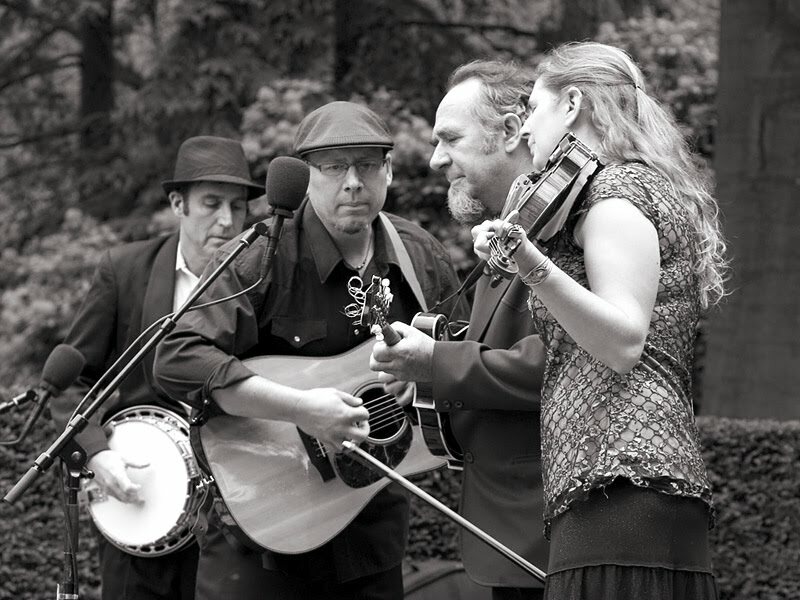 Vote for Cold Mountain Band to support bluegrass! There is a direct link to the voting on their website. As bluegrass is a very small genre in Sweden, we need all the help we can get from the bluegrass community in Europe! Czech Bluegrass Spring III: Luka nad Jihlavou, 10-11 Apr. The weekend 10-11 April I spent in a little town, Luka nad Jihlavou, where several times in the year an event called the Bluegrass Minifestival 'U Kuritku' takes place in a local restaurant. That night three bands were on the program. 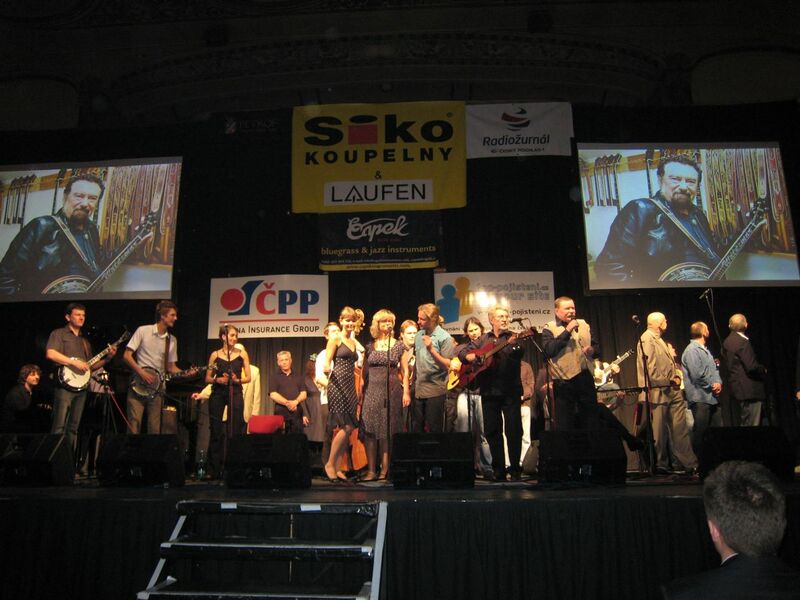 The festival opened with the Giant Mountain’s Band [above], from South Bohemia. I saw them for the first time; through they suppose to exist for several years. 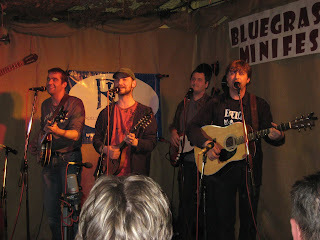 The band has an American mandolin player and lead singer, Lucien Holmes, who moved to the Czech Republic in 2006. Before he used to play with the Highwater Bridge and Turtle Mountains Boys from North Dakota. I liked their performance very much. Also the next young band, Jewelci [above] from southern Moravia, was new for me. They sang mostly in Czech and it was a pleasure to listen. The highlight of the night everybody was waiting for was when the band Monogram [above] came on stage. They performed a couple of songs from their newest CD, Hit the road. As surprise Ralph Schut showed up on stage with a bottle of champagne and as a godfather christened the new CD. Ralph is a young Dutch multi-instrumentalist, who moved to the Czech Republic eight years ago for the opportunity to play with young musicians on his own level. He plays with several bands now and already speaks Czech and Slovak well. His own main band is G-Runs ’n Roses (who were just named the European Bluegrass Band of the Year 2010 at the EWOB Festival in Holland). The official CD release party is supposed to be next Monday in the Gong Theatre in Prague. I am sure a great jam session followed; but I had bad luck, picked up some strange virus, and got sick. My friends brought me to their house. Still ill, I went home by train on Sunday and had to stay in bed for several days. Anyway, the next Saturday I was fit and on the road again. 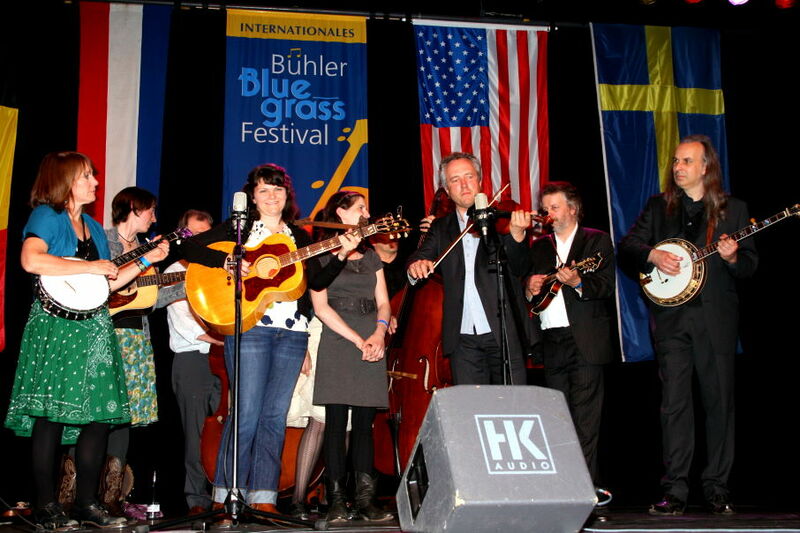 Sweden's G2 Bluegrass Band are packing for their long-awaited trip to the US. After four or five years of hoping, planning, and sheer hard work, they leave Europe on 8 June for an active four-month tour. 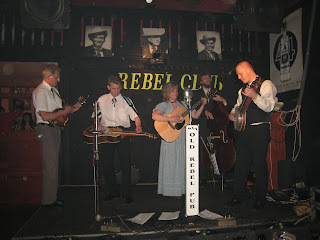 After settling in to Nashville, TN, which will be their home base, the band's schedule begins at the Fathers' Day Bluegrass Festival in Grass Valley, CA (17-18 June), from which they fly back across the continent to the world-famous Station Inn in Nashville (19 June). Following dates on the schedule can be seen on their MySpace site. Their new album Untapped routes will be available at their shows, and an official release date for it in the US is being arranged. The brand new single 'Still standing' can be bought on Klicktrack. G2 are hoping for the votes of all their fans and friends in the IBMA ballot for Emerging Artist of the Year. Among the names of those nominated this year for the IBMA's Hall of Fame, two nominees - both in the recording industry - were born in Germany. Martin Haerle (1939-90) was born in Stuttgart and moved to the USA in 1960, following his love for bluegrass and traditional country music. His experience with the Starday and United Artists labels led to his co-founding (with Arthur 'Guitar Boogie' Smith) of CMH Records in 1975. 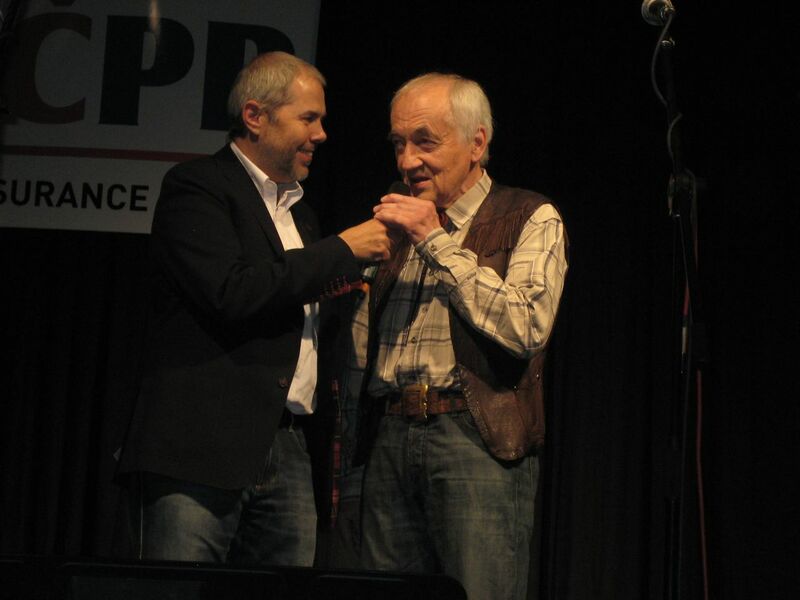 Richard Weize, born in Bad Gandersheim in 1945, founded Bear Family Records in 1974. The label's output now includes over 100 boxed sets, with much bluegrass and traditional country material unavailable anywhere else. 'Sweden’s got talent 2010': vote for Cold Mountain Band! 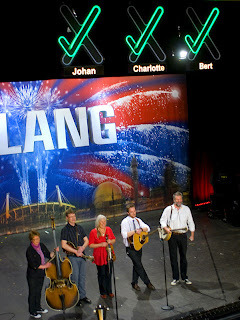 The bluegrass group Cold Mountain Band played themselves all the way to the semi-final of TV 4’s 'Sweden’s got talent' ('Talang 2010'). 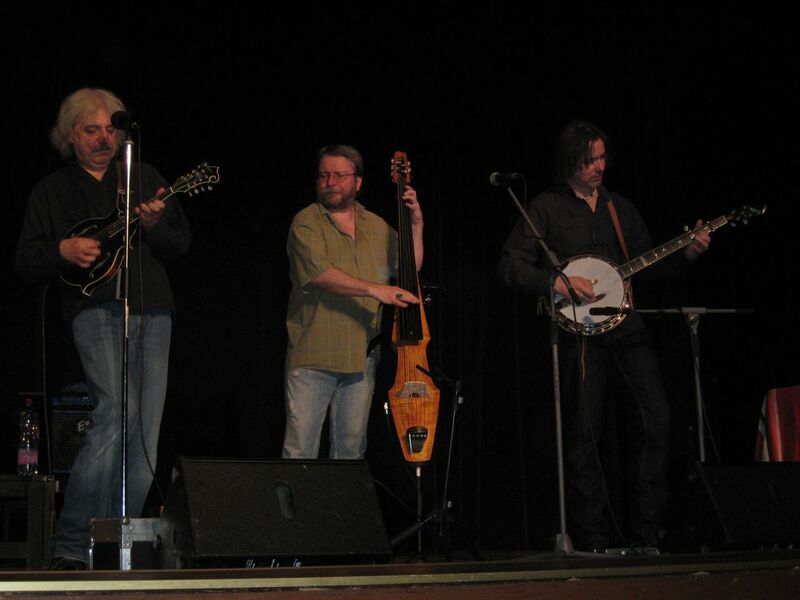 Even though they shone and consider themselves to be winners anyway, Cold Mountain Band weren’t one of the two acts that were chosen to play in the final. 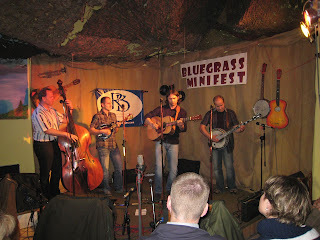 Bluegrass music in Sweden receives very little air-time despite the fact that those who discover it are often enthusiastic. 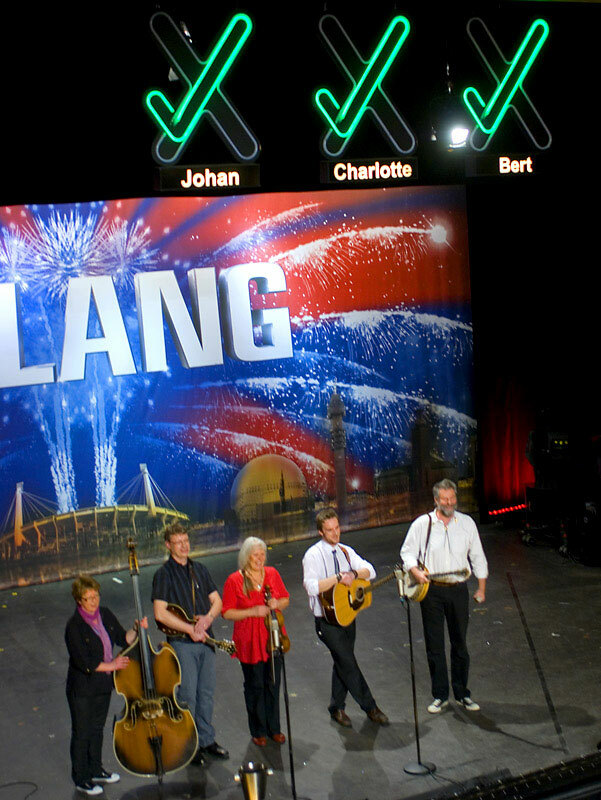 Cold Mountain Band have now performed twice in 'Sweden’s got talent', which is sent during prime time viewing (Friday, 8 o’clock) and their ultimate goal has always been to spread bluegrass music in Sweden. Cold Mountain Band still has a chance to play in the final! Two more acts will be chosen to play in the final after the semi-finals have been aired. One of the acts will be chosen by the jury and the other via the internet, where the general public will get the chance to vote for their favorite act. The last semi-final will be aired this Friday (28 May) at 8 o’clock local time. Internet voting will start after the show and continue the weekend through. Vote for Cold Mountain Band if you would like to see them in the final. Visit the band's homepage, click on TALANG 2010, and you can see all their performances from the show. When the voting starts a link will also be laid out on the site. Alternatively, navigate to YouTube and watch the excerpts there. Tony Thomas will be in the UK from 13 September to 23 September on vacation. He will be in London and in Mistley, around 11 miles (18 km) north-east of Colchester, Essex. 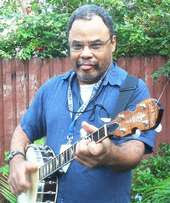 He is an African-American banjoist who helped organise the 2005 Black Banjo Gathering and the recent celebration of it. He is an historian of the five-string banjo and African-American playing of it, with chapters forthcoming in scholarly collections from Duke University Press and University of Illinois Press. He has also given several presentations on banjo history at the annual US banjo collectors gatherings. He plays old-time African American and European banjo, both down-picking and finger-picking. 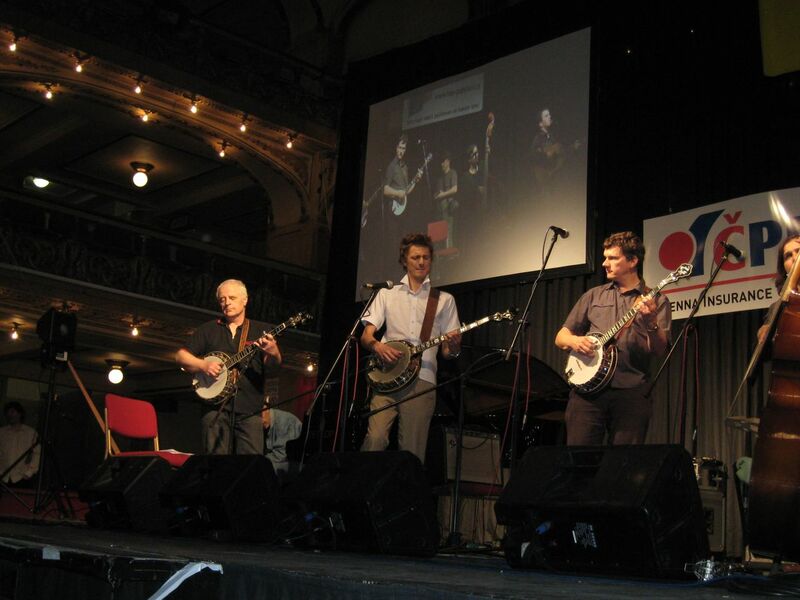 While banjo playing and performance is NOT the purpose of this trip, he will have his banjo with him and would love to get together with any banjoists or attending any nearby old-time or banjo-collector events. He will be on the Continent, visiting Sweden and Russia, but based on the Mosel in Germany between 12 August and 18 October. Contact him by e-mail if you want to get together, or know of events he might want to check out. The next concert was in my hometown, Brno, on 7 April. I am sure, also this great band is familiar to the most of you: Robert Krestan & Druha Trava. I always loved their music. 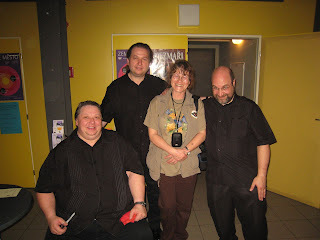 On that special night the band had to say good-bye to their long years bass player and friend Petr Sury. He is just too busy with different other music projects and will be replaced with a new, young one, named Tomas Liska. Also this concert was sold out. They had played a lot of their old favorite songs, mostly written by Robert Krestan. Also some from his last recording, Dylanovky - the songs of Bob Dylan, which he translated into Czech. The audience loved also the instrumentals by the banjo player Lubos Malina, who also plays beautifully the Irish pipes. 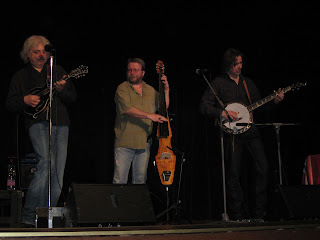 The other members of the band are Emil Formanek (guitar), Lubos Novotny (dobro), and David Lanstof (drums). 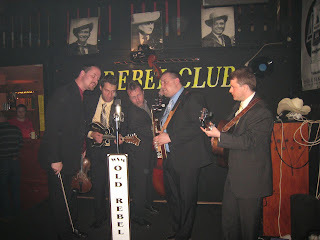 The European Bluegrass Blog has received a request from Adam for permission to use a photo that appeared on the EBB on 11 October 2008, illustrating an account by Red Wine (I) of their tour in the USA in the autumn of that year. Adam - your message was received through the blogebma.news link, which unfortunately does not transmit either e-mail attachments or addresses of senders; so a reply cannot be sent directly to you. The photo in question remains the property of Red Wine, and permission should be sought from the band. This can be done by sending an e-mail to Martino Coppo. Petr Hrubý of All Bells & Whistles (CZ) sends a reminder that this weekend, in the southern Bohemian town of Strakonice, one of the biggest and best Czech bluegrass festivals will be held: the famous Jamboree (not to be confused with the Banjo Jamboree at Čáslav, which will take place one month later). The Jamboree's website can be read in an English version. 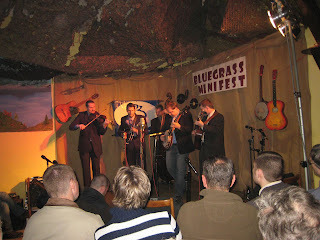 Previous entries on the European Bluegrass Blog about the Jamboree can be found at 12 April 2010 and 12 June 2009. Thanks to Alle Hamstra for these and many other photos taken at the 28th Big Bear Festival, held at Zuidlaren, the Netherlands, on 24 May. You can see all the Big Bear photos in this internet album. The event was presented as usual by the banjo-maker Jarda Prucha in a nice concert hall. The Kruger Brothers - Jens, Uwe, and the third 'brother', Joel Lansberg - are now based in North Carolina, and moved there from Switzerland about eight years ago. They always had a good connection to Czech audiences. On their last European tour they played several sold-out concerts in Switzerland, Germany, the Czech Republic, and the UK. Jens gave some banjo workshops as well. For the first time we had seen the band with a drummer. But he was very discreet and really enriched their music. The fans came from all over the country and the place was bursting with people. Some, less happy, couldn’t even get in. A Czech band, the New Section (above) opened the show; they performed mostly original songs with Czech lyrics. Audience loved them, but everybody was waiting for the Masters! And finally the Kruger Brothers showed up. We were listening almost without breathing, so beautiful the music was. Toward the end Jens switched to a Prucha banjo and played the last encore on it. Who of you doesn’t know them yet, don’t miss their performance, when they are somewhere around your town. They are really awesome! Just like in previous years, the EBMA will put together the program for our (After Hours) 'international' showcases, to focus on some of the bluegrass music that comes from other countries than the USA. The projected times will be on Tuesday and Wednesday, 28-29 Sept. 2010 (between 11.00 p.m. and 2 a.m.). If you are (or know of) a non-US band that is planning to attend this year's World of Bluegrass, and would like to perform on one of these nights, please let me know. For the costs involved in organising these 'Foreign Affairs' showcases, we are looking for sponsors, preferably also from non-US participants at the World of Bluegrass. We will be happy with any contributions (in the past they varied from $25 to $100). If you are inclined to support us, please let me know, and we can do the actual transaction in Nashville. I will write you a receipt, and happily mention your generosity on our flyers. Hope to see all of you again in Nashville! 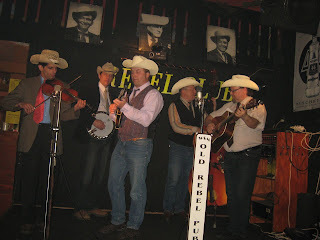 The Danilo Cartia Band announces that the next 'Rome Bluegrass Jam'/'Bluegrass Jam Roma' will be held on Sunday 30 May 2010 in the Cantine Blues, Via della Batteria Nomentana 66/68, Rome, Italy. Admission free. 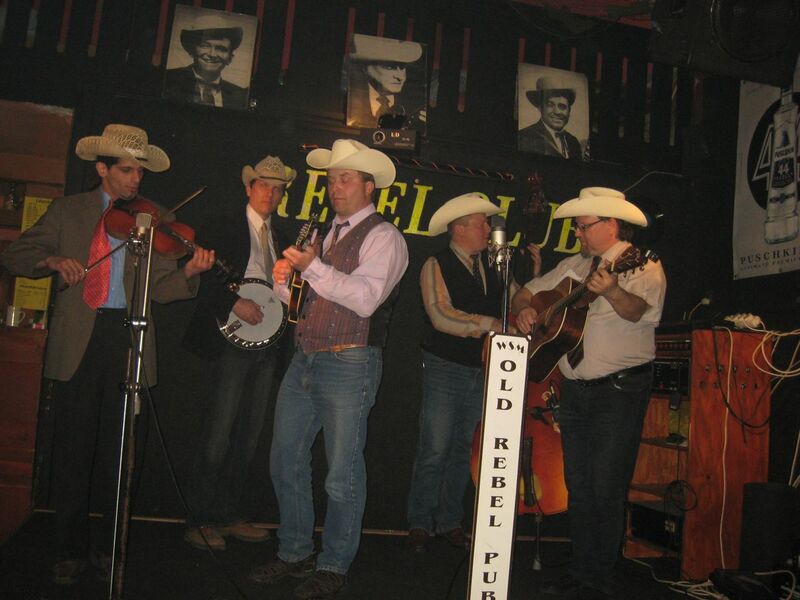 'Rome Bluegrass Jam' is the country music event in Rome that brings together the best country and folk musicians around the capital, to make this kind of music and its history more widely known. 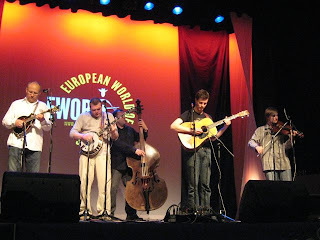 Congratulations to Earlybird Stringband, the #2 European Bluegrass Band 2010 at the wonderful EWOB festival this year, the first Norwegian band among the top three ever. This is one of the new and promising young bluegrass bands coming to the forefront of the bluegrass scene in Norway the last couple of years. There are still a few new bands emerging this year at the Risor festival, but not as many as the record high from last year with 10 new bands. The festival scene is growing slowly, there are still very few bluegrass events other than the Risor festival, but bluegrass bands are frequently featured on country, rock, and pop festivals. One new and special event this year is a bluegrass weekend (9-11 July) at Bjornhollia, one of the mountain cabins in mid-Norway, almost 1000m above sea level. Two or three of our best bands will be there, but you need to walk 8 km on a mountain trail to get there; and with 90 beds available you should be prepared to carry your own tent into the area. Or use a mountain bike. Something special, yes; but a wonderful lifetime experience, I am sure. There is also a one-day local event in Selbu - nothing serious but lots of fun and bluegrassy music by local bands. The Risor Bluegrass Festival starts Monday 12 July with a full workshop in all bluegrass instruments, plus harmony singing, songwriting, and clawhammer banjo. It ends on Thursday, just before the festival concerts start. 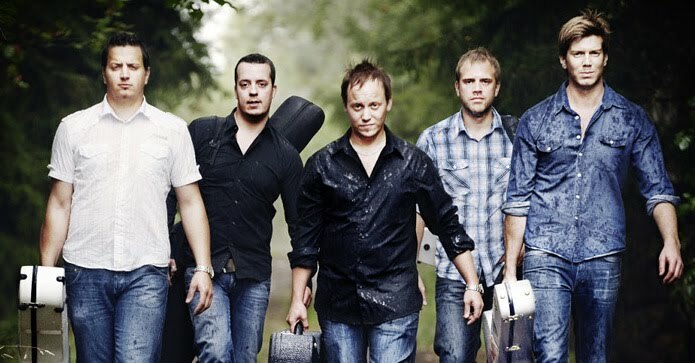 As in previous years the #1 European Bluegrass Band of the year will be here, G-Runs ‘n Roses (CZ). 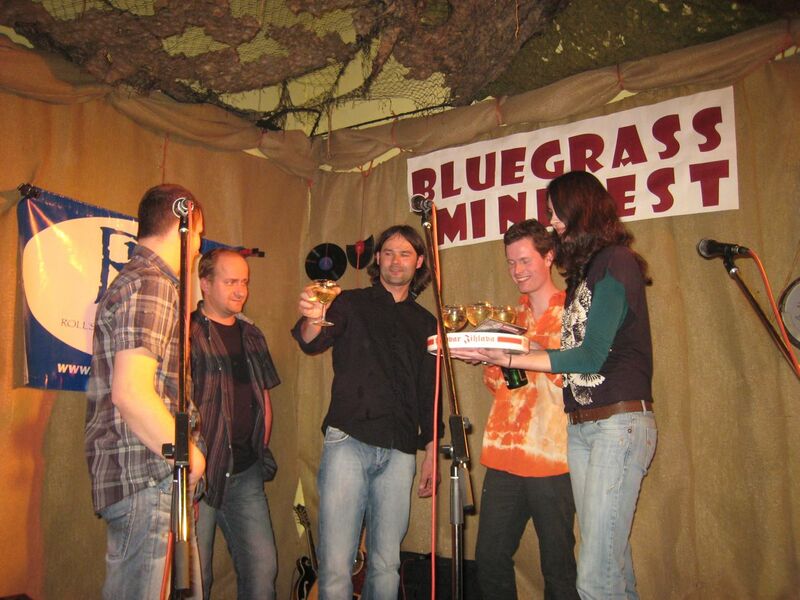 And the #2 band, Earlybird Stringband (NO), plus the #1 Audience Popularity Award winners, Sunny Side (CZ). The line-up also includes a few other foreign bands; Acousticure (H), Hayseed Dixie (US), Blueland (SK), and our excellent workshop instructors in Barry & Holly Tashian’s band and Sue Thompson & the Brandejs Band, plus all the Norwegian bands. Over 30 bands total and 40 concerts over three wonderful festival days. And we give 50% on the festival passes to all EBMA members living outside Norway, a small help towards the higher travelling cost. Chris Jones's many fans in Europe will be glad to know that today (25 May) his latest single, 'What you do', was released on Airplay Direct. The track comes from Cloud of dust, the latest CD by Chris and his Night Drivers band, who earned the most votes in an IBMA poll in which voters were asked which artist they would most like to see at the IBMA Fanfest. Chris will be featured and interviewed on Terry Herd's 'Into the Blue' show on Bluegrass Radio this week. For more details, see today's Bluegrass Blog. Thanks to Jan Michielsen of 4 Wheel Drive (D/NL/B) for this link to a five-minute feature from R.TV Baden-Baden on the 8th Bühl International Bluegrass Festival (14-15 May). The footage was shot at the free concert by 4WD in the Johannesplatz, Bühl, on the morning of Saturday 15 May (see photo above), and includes an interview with Walter Fuchs, musical director of the festival. Friday 28/05: The Sons of Navarone will be the support act for a concert of Steve Phillips (Notting Hillbillies, Mark Knopfler...). Concert starts at 20:30, doors open at 20:00. 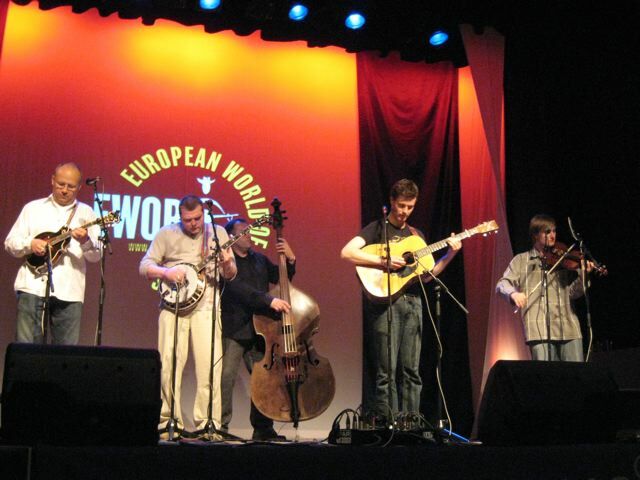 Congratulations to Rawhide [above], voted 3rd best European bluegrass band at this year's European World of Bluegrass. 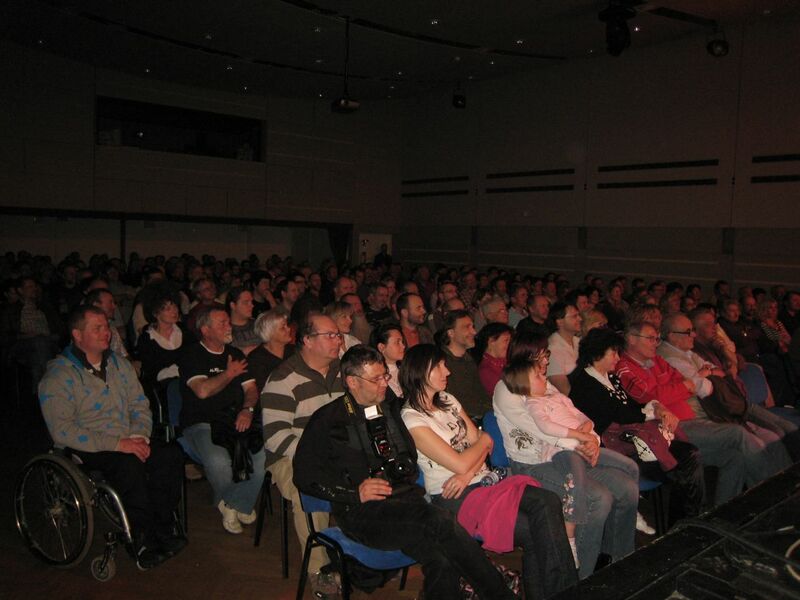 Forty preselected bands from all over Europe were competing. If you want to become an 'official' fan of Rawhide, you can do so now on their Facebook page. 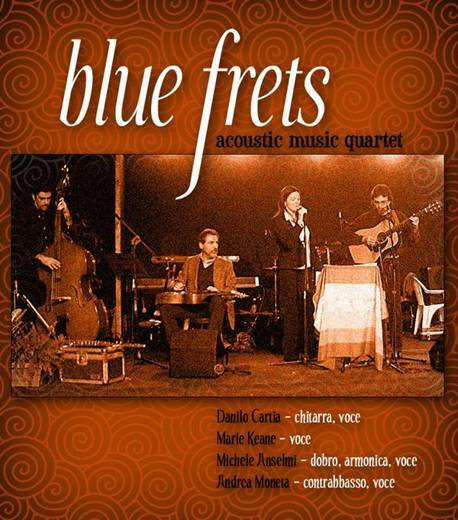 The Blue Frets Acoustic Music Quartet (I) consists of Danilo Cartia (guitar, vocals), Marie Keane (vocals), Michele Anselmi (dobro, harmonica, vocals), and Andrea Moneta (upright bass, vocals). Tomorrow (25 May 2010) at 20:00 the Blue Frets will take part in 'Qualcosa che vorrei dirvi – ricordo di Paolo Giuntella' at the Teatro San Genesio, Via Podgora 1 Rome, Italy. Danilo is also banjo-player and leader of the Danilo Cartia Band, who host the Rome Bluegrass Jam. The Grascals are coming over to play at Craponne Country Rendez-Vous on Friday 23rd. 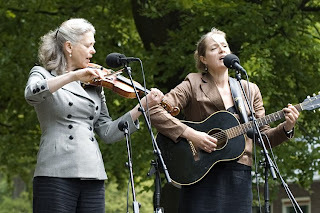 Also at Craponne, the Quebe Sisters and Bradley, Gulley, & Fox (Saturday 24th). 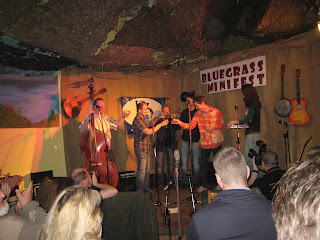 Thanks to Lilly Pavlak for photos of the bands who won awards at this year's European World of Bluegrass Festival a week ago. 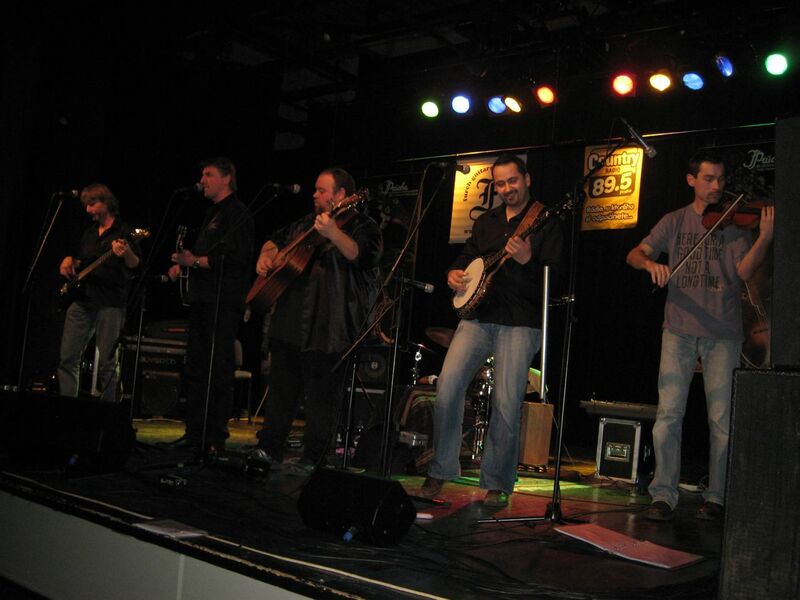 Shown above are G-Runs 'n' Roses (CZ), who are #1 European Bluegrass Band for the next twelve months, and also won the #3 place in the Audience Popularity Awards. More photos of them and the other award winners can be seen here. The International Bluegrass Music Museum requests your assistance in getting the word out about our upcoming festival, ROMP: the River Of Music Party, 23-26 June 2010. ROMP is the Museum's annual fundraiser, with all proceeds going to the preservation of bluegrass music history, artifacts, and collections. We have very little funding for advertising and therefore rely on the goodwill of our friends and supporters. If you'd like to help, we'd be happy to trade links with you. Please direct your link to us here and let us know how you'd like yours to be posted. * A stellar lineup of 30 bands from four countries with music ranging from traditional and progressive bluegrass to jam bands. Please see the lineup here. 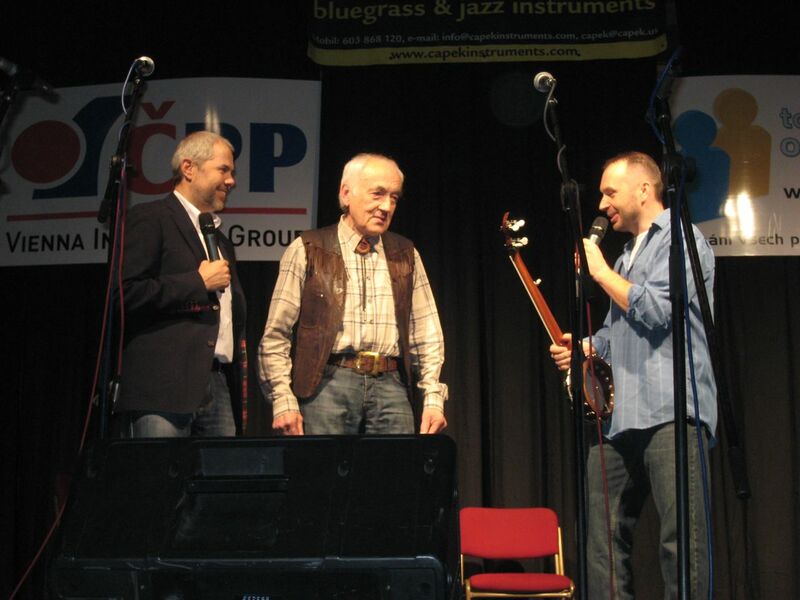 * Two historic reunions: the Pioneers of Bluegrass and the Blue Grass Boys. Between 75 and 100 legends will be in attendance. Come to ROMP to meet and jam with these musicians, hear their stories and their music. * The kick-off to the Bill Monroe Centennial Celebration: an exhibit of visual art inspired by the lyrics of his original songs. * The Bluegrass Masters Film Festival, featuring the world premiere of 8 documentary films on the lives of the following iconic musicians: Mike Seeger, the Dillards, Paul Williams, Tater Tate, Vic Jordan, Gloria Bell, Jack Cooke, and Noah Crase. Also featured are the Goins Brothers and Curly Seckler, among other films. * Great ticket prices, with deep discounts for seniors, active military and students. Click here for tickets. Children 12 and under get in free. Four-day family passes available for $150 (in advance only until 6/16/10). * Hall of Fame Unveiling, The Legends Concert, workshops, trade show, great food (coolers and picnics ok), museum tours, educational forums, live filming and radio broadcasting. Join the party at the Bluegrass Museum in Owensboro, Kentucky... a great time for a great cause. 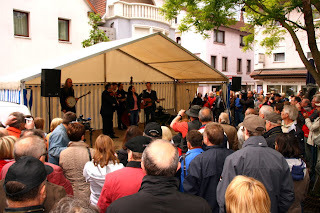 Over 1000 visitors from all over Europe came to Bühl to attend the two-day event with six acts - Uncle Earl (USA), James Talley (USA), the Midnight Ramblers (USA), 4 Wheel Drive (NL), the G2 Bluegrass Band (S), and the Sons of Navarone (B). 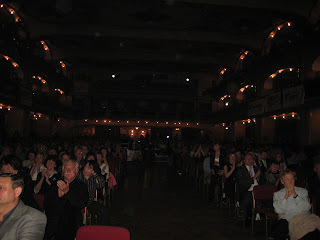 Each band was celebrated by the audience with standing ovations, and never before was this event covered by the press with such enthusiasm. Headlines even on front pages read 'Bluegrass Virus Is Spreading', 'Not Without Encores Back To The Dressing-Room', 'Music From The Southern States Of The US Is Winner', 'Bühl, Europe’s Bluegrass Capital', 'Strong 4 Wheel Drive And Fresh Old-Time Sounds'. After a big finale with all bands on stage, all officials were satisfied: Mayor Hans Striebel wants to extend the festival up to three days, chief of cultural administration Wolfgang Jokerst promised to push the event next year even more, and event producer Walter Fuchs was just happy as can be and rushed back to his office promising another great festival on 13-14 May 2011. Press reports and many more photos can be seen on the festival website; nearly 200 photos by Werner Friedli are here; and seven from Jan Michielsen of 4 Wheel Drive are here. Following on from the EBB post of 11 Feb. 2010, Richard F Thompson forwards the news that the Circle of Friends for Jan Organizing Committee (Carla Osborne, Dell Tims, Julie Elkins, Lennie Green, Milton Harkey, and Monty Smith) has organised another benefit concert for Jan and Theresa Johansson, to take place on Sunday 27 June 2010, from 1.00 to 6.30 p.m., at Bond Park Amphitheater in Cary, North Carolina. The impressive lineup of bands includes Kickin Grass, Al Batten & the Bluegrass Reunion, the Kruger Brothers, String Machine, Hank Bowman and Lin Peterson, and a grand finale with Jan and Friends, including Julie Elkins, Lindsey Tims, John Teer, Jerry Stuart, David Tate, John Wade, and Danny Gotham. 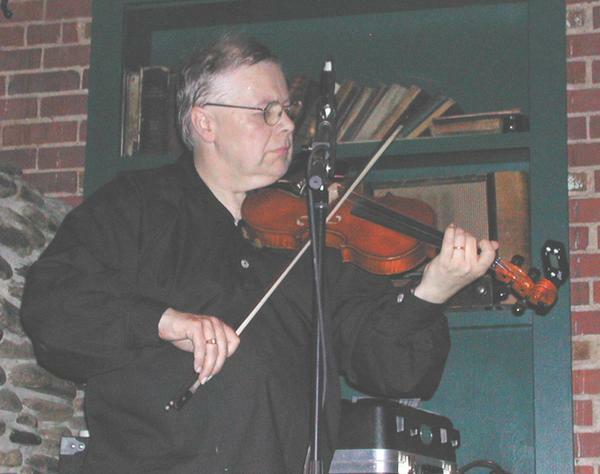 Two previous benefit concerts have been held for the Swedish-born fiddler, whose heart problems began at the age of 36. He has had triple bypass surgery, a pacemaker, and most recently the installation of a heart pump. However, this is an interim measure: he will ultimately need a heart transplant, with consequential expenses running into hundreds of thousands of dollars. All proceeds from the benefit concert on 27 June will go to Jan’s family to help defray medical expenses and lost income. All performers and event organisers are donating their time and talents to raise money and show their support and appreciation for Jan and his wife Theresa. For admission to the concert, the suggested donation is $15 for adults. Children under 12 free. All donations will go directly to the National Foundation for Transplants to help Jan and Theresa. Please make checks payable to the National Foundation for Transplants and write 'For Jan Johansson' on the memo line. You can also visit their website for information and updates about Jan and to make a donation online. If you would like to volunteer to assist in staging the concert, please e-mail or call Monty Smith at +1-919-614-4579. For more information contact Lennie Green (telephone +1-919-772-3319; e-mail) or Carla Osborne e-mail. Thanks to Richard F Thompson, editor of British Bluegrass News, the magazine of the British Bluegrass Music Association, for the news that BBN has issued the tenth (May 2010) in its series of e-newsletters to BBMA members, carrying news that breaks between issues of the quarterly magazine. It includes many items of bluegrass news outside Britain. Those interested in joining the BBMA can do so by contacting the Membership Team, Clare and David Rozzell, 26 Martin Road, Portsmouth, Hampshire, PO3 6JZ; e-mail. Banjo innovator Tom Nechville of Nechville Musical Products (USA), who will be in Europe this coming autumn, announces that he has added the following instruments to his special-price Insider Deals offers: a lightweight Athena, a walnut Saturn, and a mahogany Vintage. Ask also about the Turbo Module Electric Banjo Insert, comfort bevel armrests, and Enterprise bridges. Call Tom's mobile (+1 612-275-6602) or sales office (+1 253-293-5082) or e-mail. Be sure to mention that you want the 'Insider Deal' when ordering to get these offers. Update 21 May: Nechville Musical Products are also sponsoring the Didmarton Bluegrass Festival (2-5 September 2010) in the UK, by donating a Phantom banjo (as played by Leon Hunt), which will be raffled at the festival. Preparations for the Banjo Jamboree festival in Caslav (June 18-19) are in full swing and keep the CzBMA busy. As usual, there will be workshops on all the bluegrass instruments + vocals (by Sue Thompson), an All Star Band (voted last year by the audience), 20+ bands including the Banjo Jamboree Contests Winners and more. This year for the first time, there will be a theatre for children, Capek's banjo auction and the Czech banjo legend Marko Cermak will be signing his new book and calendar. 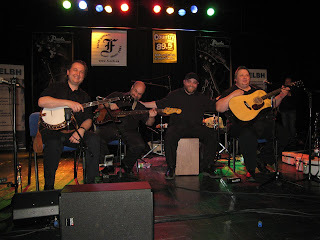 Thanks to banjo maker Jarda Prucha, the Kruger Brothers performed again to a sold out hall in Prague on March 30th. One of the finest bands in the country - Monogram - has a new CD out. It is called "Hit The Road", and there's a nice video on YouTube. Rosta Capek put together a great concert in the prestigious venue Lucerna in Prague on April 18th. 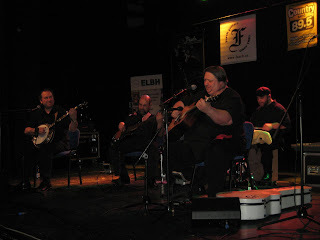 About 1'000 people attended the show which included also bluegrass acts Petr Brandejs Band, with a triple banjo arrangement of Dixie Breakdown or mandolin wizard Radim Zenkl. Previously announced Martino Coppo unfortunately got stuck in Italy due to the Icelandic volcano ash. All the money made was sent to the musical secondary school for blind students. The new band Wind has just released its first CD "Bourani zdi" (Breaking down the walls). Also the band Blackjack has a new CD out "That Old Book of Mine". 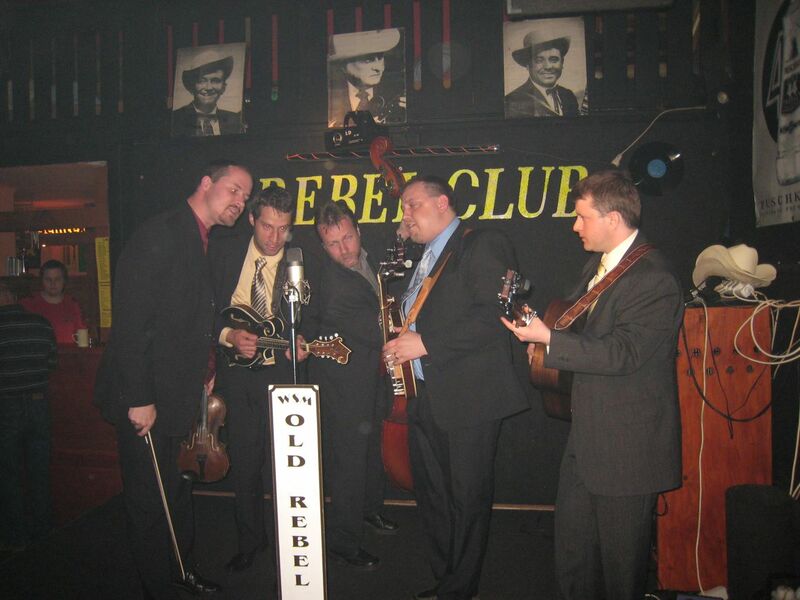 The current CzBMA Newsletter Bluegrassove listy features an extensive interview with Blackjack's banjo player Martin Kubec. After the show you are invited to taste a glass of Bulgarian wine. Entrance is free.